Seven Samurai (七人の侍, Shichinin no Samurai) is a 1954 Japanese epic historical drama adventure film co-written, edited, and directed by Akira Kurosawa. The story takes place in 1586 during the Sengoku Period of Japanese history. It follows the story of a village of farmers that hire seven ronin (masterless samurai) to combat bandits who will return after the harvest to steal their crops. Since its release, Seven Samurai has consistently ranked highly in critics' greatest films lists, such as the BFI's Sight and Sound and Rotten Tomatoes polls. It has remained highly influential, often seen as masterpiece and one of the most "remade, reworked, referenced" films in cinema. Bandits approach a mountain village, but their chief decides to spare it until after the harvest because they had raided it before. The plan is overheard by a farmer. Three farmers ask Gisaku, the village elder and miller, for advice. He declares they should hire samurai to defend the village. Since they have no money, Gisaku tells them to find hungry samurai. After little success, the group watch Kambei, an aging but experienced rōnin, rescue a young boy who had been taken hostage by a thief. A young samurai named Katsushirō asks to become Kambei's disciple. The villagers then ask for help, and after initial reluctance, Kambei agrees. He recruits old friend Shichirōji and, with Katsushirō's assistance, three other samurai: the friendly, wily Gorobei; the good-willed Heihachi; and Kyūzō, a taciturn master swordsman whom Katsushirō regards with awe. Although inexperienced, Katsushirō is selected because time is short. Kikuchiyo, a man who carries a family scroll that he claims makes him a samurai, follows the group despite attempts to drive him away. When the bandits finally attack, they are confounded by new fortifications, including a moat and wooden fence. Several bandits are killed according to Kambei's plan. As the bandits enter the village singly, they are hunted down and killed by groups of farmers armed with bamboo spears. Gisaku refuses to abandon his mill on the outskirts of the village and perishes with his family, who tried to save him. A lone baby is rescued by Kikuchiyo, who breaks down in tears, as it reminds him of his own childhood. The bandits possess three Japanese matchlock firearms. Kyūzō ventures out alone and returns with one. An envious Kikuchiyo abandons his post—and his contingent of farmers—to bring back another. He is chastised by Kambei because, while he was gone, the bandits killed some of his farmers. The bandit chief attacks again, and Gorobei is slain. That night, Kambei predicts that, due to their dwindling numbers, the bandits will make one last all-out attack. Meanwhile, Katsushirō and Shino's relationship is discovered by her father. He hits her until Kambei and the villagers intervene. Shichirōji calms everyone down by saying the couple should be forgiven because they are young and that before any battle, passions can run high. The three surviving samurai watch as the joyful villagers sing while planting their crops. Kambei—standing beneath the funeral mounds of his four dead comrades—reflects that it is another pyrrhic victory for the samurai: "In the end we lost this battle too. The victory belongs to the farmers, not to us." Takashi Shimura as Kambei Shimada (島田勘兵衛, Shimada Kanbei), a ronin and the leader of the group. The first "recruited" by the villagers, he is a wise but war-weary soldier. Yoshio Inaba as Gorōbei Katayama (片山五郎兵衛, Katayama Gorōbei), a skilled archer recruited by Kambei. He acts as the second-in-command and helps create the master plan for the village's defense. Daisuke Katō as Shichirōji (七郎次), an old friend of Kambei and his former lieutenant. Kambei meets Shichirōji by chance in the town and he resumes this role. Seiji Miyaguchi as Kyūzō (久蔵). He initially declined an offer by Kambei to join the group, though he later changes his mind. A serious, stone-faced samurai and a supremely skilled swordsman whom Katsushirō is in awe of. Minoru Chiaki as Heihachi Hayashida (林田平八, Hayashida Heihachi), recruited by Gorōbei. An amiable though less-skilled fighter. His charm and wit maintain his comrades' good cheer in the face of adversity. Isao Kimura as Katsushirō Okamoto (岡本勝四郎, Okamoto Katsushirō), a young untested warrior. The son of a wealthy landowner samurai, he left home to become a wandering samurai against his family's wishes. After witnessing Kambei rescue a child who was taken hostage, Katsushirō desires to be Kambei's disciple. Toshiro Mifune as Kikuchiyo (菊千代), a humorous character who initially claims to be a samurai, he even falsifies his family tree and identity. Mercurial and temperamental, he identifies with the villagers and their plight, and he reveals to the group that he is in fact not a samurai, but rather a peasant. Eventually however, he proves his worth. Yoshio Tsuchiya as Rikichi (利吉), a hotheaded and relatively young villager. He has a painful secret concerning his wife. Bokuzen Hidari as Yohei (与平), a very timid old man who shares some comic scenes with Kikuchiyo. Yukiko Shimazaki as Rikichi's wife. She is unseen in the early part of the film, the secret of her whereabouts eventually leads to tragedy. Kamatari Fujiwara as Manzō (万造), a farmer who fears for his daughter's purity when surrounded by the dashing samurai, but is later forced to accept her love for Katsushirō. Keiko Tsushima as Shino (志乃), Manzō's daughter, who falls in love with Katsushirō. Kokuten Kōdō as Gisaku (儀作), the elder miller and village patriarch, referred to as "Grandad", who tells the villagers to hire samurai to protect themselves. Atsushi Watanabe as a bun seller. Yoshio Kosugi as farmer Mosuke. Shinpei Takagi as the bandit chief. The film was the first samurai film that Akira Kurosawa directed. He had originally wanted to direct a film about a single day in the life of a samurai, but later discovered a story about samurai defending farmers in his research. According to actor Toshiro Mifune, the film was originally going to be called Six Samurai, with Mifune playing the role of Kyuzo. During the six-week scriptwriting process, Kurosawa and his screenwriters realized that "six sober samurai were a bore—they needed a character that was more off-the-wall". Kurosawa recast Mifune as Kikuchiyo and gave him creative license to improvise actions in his performance. 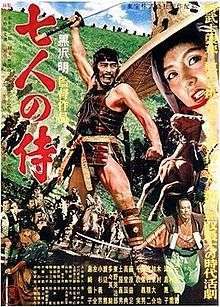 Kurosawa refused to shoot the peasant village at Toho Studios and had a complete set constructed at Tagata on the Izu Peninsula, Shizuoka. Although the studio protested the increased production costs, Kurosawa was adamant that "the quality of the set influences the quality of the actors' performances... ...For this reason, I have the sets made exactly like the real thing. It restricts the shooting but encourages that feeling of authenticity. He also spoke of 'intense labour' of making the film: "It rained all the time, we didn't have enough horses. It was just the kind of picture that is impossible to make in this country." The choreography for the film was led by Yoshio Sugino of the Tenshin Shōden Katori Shintō-ryū. Initially Junzo Sasamori of the Ono-ha Itto-ryu was working along with Sugino, but he was asked by the Ministry of Education to teach in Europe during production. According to Michael Jeck's DVD commentary, Seven Samurai was among the first films to use the now-common plot element of the recruiting and gathering of heroes into a team to accomplish a specific goal, a device used in later films such as The Guns of Navarone, Sholay, a Cantonese adaptation, "江湖七虎-The Seven Tigers of Rivers and Lakes", "the western remake The Magnificent Seven, and Pixar's animated film A Bug's Life. Film critic Roger Ebert speculates in his review that the sequence introducing the leader Kambei (in which the samurai shaves off his topknot, a sign of honor among samurai, in order to pose as a monk to rescue a boy from a kidnapper) could be the origin of the practice, now common in action movies, of introducing the main hero with an undertaking unrelated to the main plot. Other plot devices such as the reluctant hero, romance between a local woman and the youngest hero, and the nervousness of the common citizenry had appeared in other films before this but were combined in this film. Seven Samurai grossed 268 million yen in the first 12 months of its release. Eventually, it became Japan's third highest-grossing film of 1954. It once ranked fifth on Rotten Tomatoes's action/adventure voting list. It is also ranked number seven on Rotten Tomatoes' top 100 art house and international films. However, in interview with R.B Gadi, Kurosawa expressed how "The American copy of the The Magnificent Seven is a disappointment, although entertaining. It is not a version of Seven Samurai". :42 Stephen Prince argues that considering Samurai films and Westerns respond to different cultures and contexts, what Kurosawa found useful was not their content but rather he was inspired by their levels of syntactic movement, framing, form and grammar. Director Zack Snyder revealed the film to be an influence on the upcoming Justice League film. Some film critics have noted similarities between Pixar's Bug's Life and Seven Samurai. At three hours, twenty-seven minutes (207 minutes), Seven Samurai would be the longest picture of Kurosawa's career. Toho Studios originally cut fifty minutes off the film when screening it for American distributors for fear that no American audience would be willing to sit through the entire picture. A 198-minute VHS copy was acquired by the British Film Institute in 1989, and a digitally restored version of 190 minutes was exhibited in the UK in 1991; it was the first film released for sale by the British Film Institute accompanied by a documentary, historical notes and biographies. A near-complete 203 minute version was re-released in the U.S. in 2002. A Criterion Collection DVD version of the film was released containing the complete original version of the film (207 minutes) on one disc and a second Criterion DVD released in 2006 also contains the digitally remastered, complete film on two discs, as well as an additional disc of extra material. A region 4 DVD of the full 207 minute cut was released in 2004 by Madman Entertainment under its Eastern Eye label. A Blu-ray edition of the full length edition was released by the Criterion Collection on October 19, 2010. 1 2 3 Sharp, Jasper (7 May 2015). "Still crazy-good after 60 years: Seven Samurai". British Film Institute. Retrieved 16 February 2015. ↑ Because the Japanese language has no definite article, the question arises as to whether the proper English translation of the title is Seven Samurai or The Seven Samurai. While the former is the literal translation, either may be considered idiomatically correct. ↑ "Kikuchiyo" has a genealogy which shows he was "born the 17th of the 2nd month of Tenshô 2 (1574), a wood-dog year". Kanbei's comment is "o-nushi 13 sai niwa mienu ga" (You don't look 13…). Since the traditional way of counting ages in Japan is by the number of calendar years one has lived in, this means the story takes place in 1586. ↑ "Top 100 Movies Of All Time". Rotten Tomtoes. ↑ "Critics' top 100". bfi.org.uk. Retrieved 10 March 2016. ↑ Desser, David (Nov 1998). "Reviewed Work: The Films of Akira Kurosawa by Donald Richie". The Journal of Asian Studies. 57 (4): 1173. JSTOR 2659350. ↑ Toho Masterworks. Akira Kurosawa: It Is Wonderful to Create (DVD) (in Japanese). 1 2 3 Galbraith IV, Stuart (16 May 2008). The Toho Studios Story: A History and Complete Filmography. Scarecrow Press. p. 101. ISBN 978-0810860049. Retrieved 7 July 2015. ↑ Toshiro Mifune interview (Pamphlet). Criterion Collection. 25 August 1993. 1 2 3 Richie, Donald (1996). The Films of Akira Kurosawa (3 ed.). Berkeley: University of California Press. p. 107. ISBN 0520200268. 1 2 3 Nixon, Rob. "Behind the Camera of the Seven Samurai". Retrieved 20 February 2015. ↑ Lack, Jonathan R. "An Appreciation of Akira Kurosawa's Seven Samurai". Fade to Lack. Retrieved 20 February 2015. ↑ Roger Ebert (19 Aug 2001). "The Seven Samurai (1954)". Chicago Sun-Times. Retrieved 17 October 2008. 1 2 Cardullo, Bert (2008). Akira Kurosawa: Interviews. University Press of Mississippi. ISBN 978-1578069972. ↑ "The greatest Japanese box office hits of the 1950s". Nippon-Kino. Retrieved 27 February 2015. ↑ "Top 100 Action & Adventure Movies". Rotten Tomatoes. Retrieved 20 February 2015. ↑ "Top 100 Arthouse and International Films". Rotten Tomatoes. Retrieved 17 February 2015. ↑ "Sight & Sound top 10 poll 1992". BFI. Retrieved 17 February 2015. ↑ "BFI Sight & Sound 2002 Top 10 Poll". Retrieved 20 February 2015. ↑ "The Top 50 Greatest Films of All Time". Sight & Sound. British Film Institute. 1 August 2012. Retrieved 5 August 2012. ↑ "The 100 Best Films Of World Cinema - 1. Seven Samurai". Empire. ↑ Anderson, Joseph L. (1962). "When the Twain Meet: Hollywood's remake of 'Seven Samurai'" (PDF). Film Quarterly. 15 (13): 55–58. Retrieved 17 February 2015. ↑ Prince, Stephen (1999). The warrior's camera : the cinema of Akira Kurosawa. (Rev. and expanded ed.). Princeton, N.J.: Princeton University Press. p. 18. ISBN 978-0691010465. ↑ "Battle Beyond the Stars". rottentomatoes.com. 25 December 1980. Retrieved 10 March 2016. ↑ Gray, Beverly (2004). Roger Corman: blood-sucking vampires, flesh-eating cockroaches, and driller killers. Thunder's Mouth Press. p. 147. ISBN 978-1-56025-555-0. ↑ "Zack Snyder's Justice League Inspired By Seven Samurai". ↑ "Seven Samurai, A Bug's Life basically the Same Film". ↑ "The origins of A Bug's Life". ↑ Kenneth, Turan. "The Hours and Times: Kurosawa and the Art of Epic Storytellling". The Criterion Collection. Retrieved 20 February 2015. ↑ "Seven Samurai (1954) - The Criterion Collection". The Criterion Collection. Retrieved 2 June 2011. ↑ "NY Times: Seven Samurai". NY Times. Retrieved 22 December 2008.